It's completely the middle of winter here, maybe getting a little lighter each day, but still mostly just dark and grey. So a little colour (and fun!) is in order. 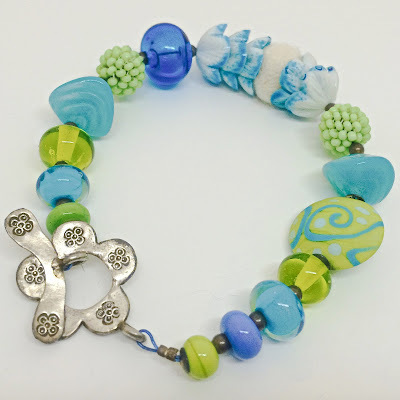 The bracelet is an essential oil diffuser bracelet - the little white ball in the middle of the white and turquoise petals is made of felt, so you can include your favourite essential oil within a wonderfully fun bracelet. A sterling silver clasp adds to lampwork beads, a handwoven beaded bead and some vintage acrylic flowers. The earrings are more lampwork - apple green disks and donuts, mini dark blue spacers and vintage acrylic navy rounds.